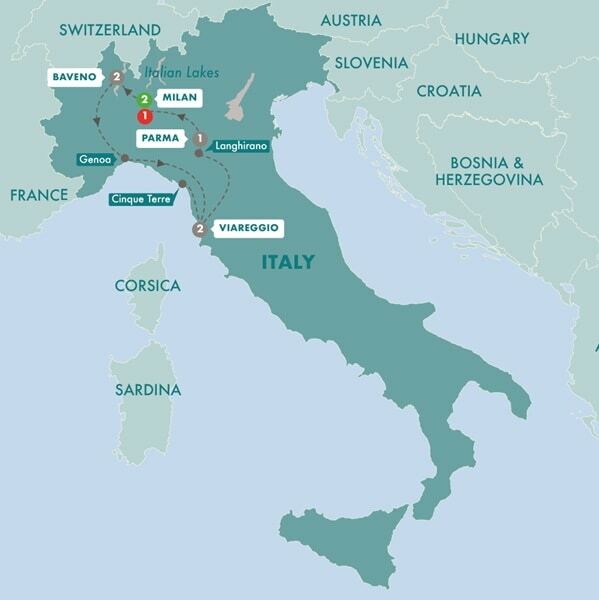 Embrace the glamour of Milan, your introduction to the fascinating sights and sounds of northern Italy. Spend the day exploring this stylish city before meeting your fellow travellers and Travel Director for a Welcome Reception and evening orientation drive. Italy's much-admired Lake District and Lake Maggiore, set against the backdrop of the Southern Alps, is the next stop on our northern Italian journey. We 'Dive Into Culture' during a visit to the Villa Taranto botanical gardens - scents of azalea, camellia and wisteria linger as we explore its lush gardens filled with rare lilies and 300 varieties of dahlias in bloom. Then it's on to our home for the next two nights and the gateway to the three Borromean islands, the lakeside village of Baveno. Consider joining an Optional Experience to one of the Borromean Islands - Isola Bella, which includes a visit inside the aristocratic Borromeo Palace and its gorgeous terraced gardens. Lap up gentle lakeside living during a full day spent at leisure in this picture-perfect setting. Spend the day relaxing or take an alpine train journey to see the magnificent panoramic views of the north. This evening, we cross the tranquil waters of Maggiore to secluded Isola Madre where we'll 'Connect With Locals' over a Be My Guest dinner. The maritime city of Genoa and birthplace of Columbus is our first stop today as we join a Local Specialist for a guided walking tour to view the city's majestic Renaissance and Baroque architecture. Visit Via Garibaldi, the historic centre of Genoa lined by ancient palaces, before continuing to the seaside town of Viareggio this afternoon. Today is a feast for the senses. Crossing the scenic Appenine mountains, we venture towards Parma, renowned for its famous Parma ham and cheese. Dive Into Culture and savour the gourmet delights of this region during a visit to a working prosciutto factory near the town of Langhirano, with a brief photo stop at Torrechiara. Next we'll learn how to make parmigiano reggiano cheese at a family run caseificio. This evening, consider an unforgettable Optional Experience featuring delicious local flavours in a historic setting. Delight in the gastronomic and architectural splendour of the Emilia-Romagna region during a guided tour of Parma with a Local Specialist. See the 12th-century Piazzo Duomo with its Romanesque Cathedral and Baptistery, and Garibaldi Square, home to the Palazzo del Governatore with its ornate astronomical clock. We leave the flavours of Parma behind and embark on a scenic drive back to Milan where we'll enjoy a Farewell Dinner tonight with our travel companions and Travel Director. Our sumptuous encounter with the landscapes of Northern Italy has sadly come to an end. Transfers are available. Conditions apply.